The wreck of the British warship HMS Somerset III, which was guarding Boston Harbor the night Paul Revere slipped by on his legendary journey to Lexington in 1775, has resurfaced in the shifting sands off Cape Cod. Federal park officials, saying they may have only a limited window of opportunity, are seizing the moment and having the wreck “digitally preserved’’ using three-dimensional imaging technology. 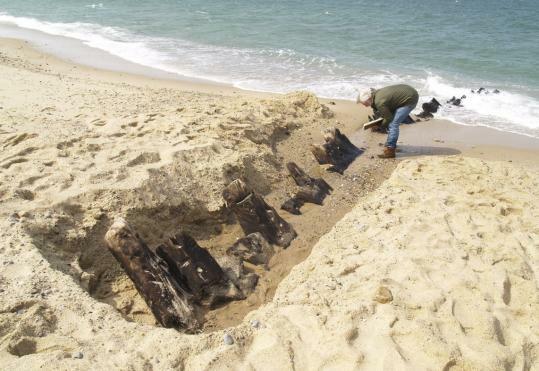 “We know the wreck is going to disappear again under the sand, and it may not resurface again in our lifetimes,’’ said William P. Burke, the historian at the Cape Cod National Seashore, noting that the last time any part of the Somerset had been sighted was 37 years ago. The Somerset fought in the American Revolution and had a crew of more than 400. In 1775, Paul Revere slipped past the ship before beginning his ride to Lexington to warn the colonials that the British were on the move. In his poem “Paul Revere’s Ride,’’ Henry Wadsworth Longfellow called it “a phantom ship, with each mast and spar/Across the moon like a prison bar.’’ The ship sank on Nov. 2, 1778, off the Cape. After erosion from recent storms, about a dozen of the Somerset’s timbers were found poking through the wet sand at low tide in the national seashore in Provincetown. Park officials hired Harry R. Feldman Inc., a land surveying company from Boston, to make the three- dimensional rendering. On Thursday, crews set up survey markers and a laser-scanning instrument, said Michael Feldman, the company’s president. The instrument was placed near the timbers, Feldman said. Using the scanner, the surveyors collected millions of data points that will be used to create the three-dimensional rendering. The company used the same technology to map Paul Revere’s house in the North End two years ago. Surveyors also used a satellite navigation system to map the Somerset wreckage so it can be found after it is submerged again. “The great thing about this technology is it not only shows a three-dimensional picture or video of what’s there, it also obtains data down to quarter-inch accuracy,’’ Feldman said. It could take additional visits to the site to complete the imaging. But when it’s done, the national seashore will have an animated fly-through of the wreck site — and anyone interested in seeing it won’t have to wait for the timbers to reappear. The imaging will only capture the timbers that are showing. The rest of the wreck, which is buried in sand, might deteriorate if the site were excavated, Burke said. Most of the crew members survived when the ship sank, but they didn’t get a warm welcome when they reached shore. Globe correspondent Hannah McBride contributed to this report.